There is an interesting talk by Andreas Antonopoulos, who is prolific for his understanding of bitcoin and other cryptocurrencies. It is an hour long but the first few seconds should give you the idea. I highly recommend you give it a watch now. It begs repeating! Why? In the past couple of weeks, Wrapped BTC (WBTC) grabbed headlines by describing a way for participants of the Ethereum network to “own” BTC in ERC20 form, allowing for the WBTC to be easily traded with other Ethereum-based tokens. This post will explore why WBTC unfortunately just recreates existing institutions and inhibits cryptocurrency’s ability to actualize its ideals and core philosophy. Minting: Creating new WBTC involves sending BTC to a "qualified custodian" who then mints quantities of the WBTC ERC20 token to a merchant. Receiving: To receive WBTC, the merchant has to KYC check the user. The user and merchant then perform a swap of BTC to WBTC. The inverse happens when the user redeems BTC for WBTC. 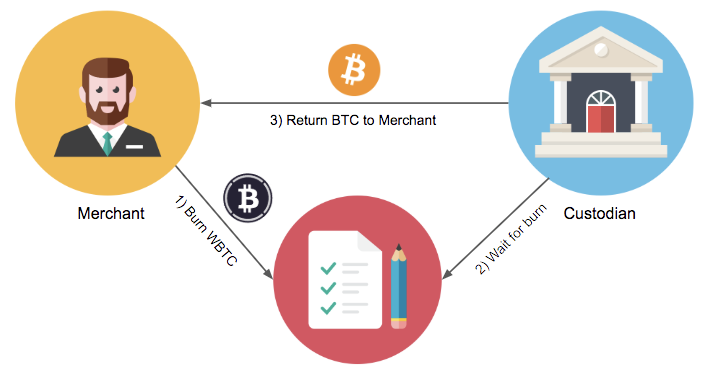 Burning: This is the process for removing WBTC out of circulation. To do this, the merchant burns an amount of WBTC on chain and after the transaction is final, the custodian sends BTC to the merchant. To reiterate, a fundamental tenet of crypto is the guarantee that access to private keys grants owners full ownership and unrestricted access to their corresponding assets. In this paradigm, there is no possibility of recovery, refund, censorship, or anything of the like. How does this apply to the ownership of WBTC? It does not. The user is actually in possession of an IOU. Much like centralised stable coins (Tether, USDC), there is no guarantee that the underlying asset is redeemable for its on-chain representation. In the case of WBTC, the merchant and user enter into an atomic swap for WBTC-BTC in theory, however in practice there is no enforcement of such. The merchants (currently Kyber Network and Republic protocol) could amass bitcoin and refuse to swap your WBTC back to BTC. Their keys, their bitcoin. Your WBTC, NOT your bitcoin. Perhaps the greatest innovation of Bitcoin is its removal of middlemen from key owners’ assets. Participants are free to transact at their will using whatever means, without limits or censorship. Removing intermediaries in exchange networks is the key to enabling the creation of shared liquidity networks, precisely because there is no central bottleneck who can silo liquidity and constrain the network by taking fees or imposing checks. In WBTC, middlemen have become systematically reincarnated. The so called “WBTC DAO” pretends to introduce some sort of check on these intermediaries, which is dubious given the insurmountable evidence against the fair allocation of guardians through a DAO. It does not help matters that the planned members of the DAO initially only include the custodian and merchants (the intermediaries). Intermediaries’ keeping a check on themselves is a novel concept indeed. The collapse of WBTC is imminent if any of these scenarios gains an inkling of reality. Unfortunately, these scenarios are not too hard to imagine. Due to the intermediated nature of WBTC, trading into WBTC requires users to undergo KYC checks with the merchant(s). Various mechanism in Bitcoin were designed to maintain the users privacy, however by entering into a WBTC trade every bitcoin address involved in the UTXOs have been de-anonymised. KYC/AML checks should be performed where applicable, however providing personal details in order to swap bitcoin seems to add friction to the user experience and act as an unnecessary burden to the end user. Here's The Good News - The Tech Is Already Here! Cross-chain atomic swaps have the capability to swap any asset (even ERC20) with bitcoin without compromising any of the above issues. Funnily, the WBTC whitepaper does a great job of explaining the pitfalls of Atomic Swaps while not mentioning the benefits. The two pitfalls that they have boiled it down to are speed and fees. It is a true spectacle that security and privacy are being compromised for speed and affordability. The entire reason bitcoin was conceived in the first place was to address disintermediation while enabling security and privacy. If the attraction of these projects is to make these compromises, their time would be much better used contributing to the current financial ecosystem by making it more transparent and privacy focused. By compromising on security and privacy in the short term, WBTC users will end up facing the same issues in the long term that disintermediated solutions like atomic swaps aim to solve today without compromises. We believe time would be better spent solving for securely exchanging the assets themselves instead of introducing custodians. Security, Privacy, Scalability. IN THAT ORDER. This has been our approach among the contributors to Liquality. Participants’ security, privacy, and self-ownership of assets are maintained using cross-chain atomic swaps. To improve performance, usability and reduce fees, we have the opportunity to bring layer 2 solutions while still maintaining the aforementioned principles. Checkout the ChainAbstractionLayer - an open source library that allows swaps without any middlemen. Watch out for the Liquality swap application that leverages these principles being released on testnet in the coming weeks, and join the disintermediation conversation.